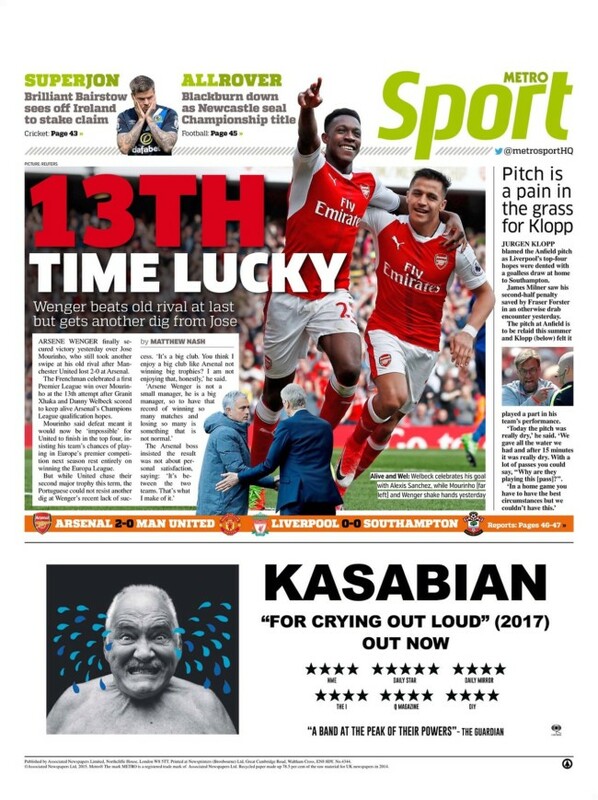 The Daily Star says under Wenger the Gunners have not won the Premier League since 2004 – true enough – and “not had success in Europe during the Frenchman’s 21 year reign”. Under Wenger, Arsenal were beaten finalists in the 1999–2000 UEFA Cup and the 2005–06 UEFA Champions League final. They qualified for the Champions’ League for 20 seasons running. Whilst not stella stuff, Wenger has always billed qualification to the Champions League as akin to winning a cup. You only need to see the joy on Liverpool manager Jurgen Klopp’s face to know how a top-four finish can define a season. Wenger’s regime does not represent decades of failure. Over in the Express, readers see Stan Kroenke,”the man with the money behind Arsenal”. That rather makes it seem that the American billionaire has bankrolled the club. He says: “Our ambition is to win the Premier League and other major trophies in Europe… Arsene is the best person to make that happen.” He is? Kroenke has been Arsenal’s majority shareholder since 2011. He’s never seen Arsenal win the title under his ownership and Wenger’s management, let alone come all that close to doing so. So why does he think it will happen next season? Because he’s “ordered” it and made it part of Wenger’s new two-year deal? 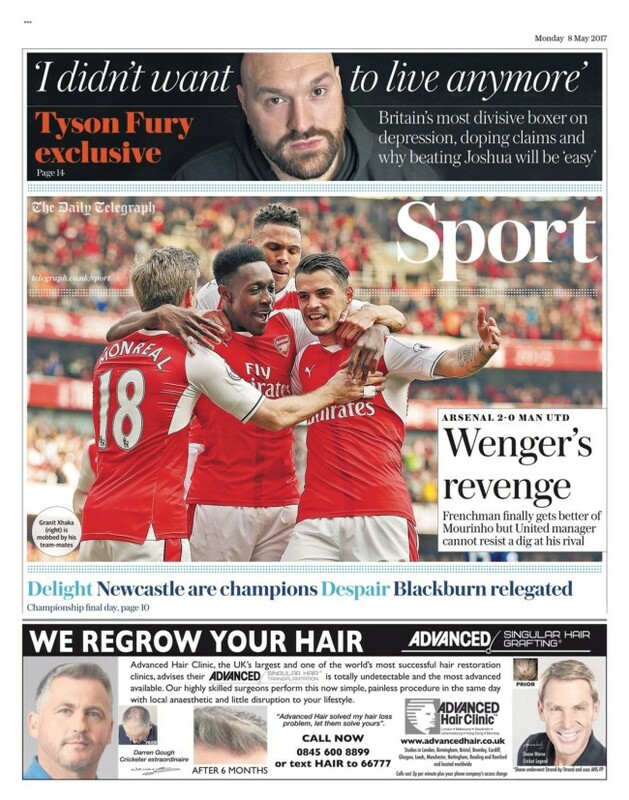 As the i points out, Arsenal’s chief executive Ivan Gazidis hailed Wenger’s new contract by talking about “pushing forward”, “evolving” and “looking forward”. But do Arsenal fans believe Wenger represents the future more than Klopp, Mourinho, Pochettino, Conte and Guardiola, the managers whose sides Wenger’s Arsenal need to beat? Arsenal finished fifth last season. They qualified for the Europa League. The next level might well be fourth followed by a shaky Champions League campaign. It’s plus ca change at the Emirates. Sánchez has attracted firm interest from Juventus, Paris Saint-Germain, Chelsea, Manchester City and Bayern in recent months, with the Bundesliga champions his preferred destination. But he won’t go there unless she takes a cut in his wages. So Sanchez is off to play for Manchester City. Right? Arsenal have been attempting to convince Sanchez and Ozil to commit their long-term future for at least a year. 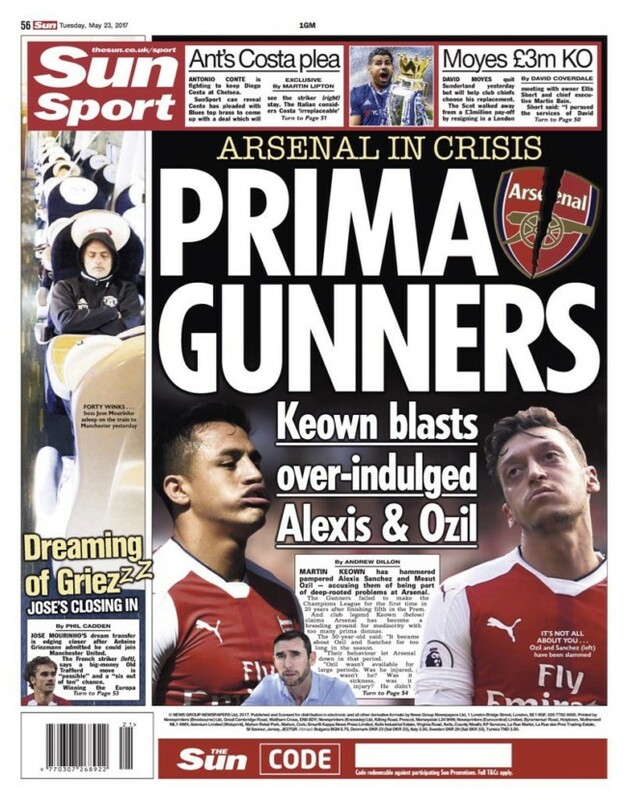 Express Sport understands the club are ready to pay as much as £300,000-a-week to keep them. But no agreement has been reached with the duo and they are now entering the final year of their contract. There has been more outside interest in Sanchez, who ended the season with 30 goals and his situation is being monitored by Manchester City, Bayern Munich, Paris St Germain, Juventus and Chelsea. Sanchez, though, likes it in London and Arsenal hope that he might be willing to commit for an extension of two years until 2020. That would give him the option of moving at a stage in his career when he is still likely to interest the very elite of Europe. Arsenal manager Arsene Wenger has signed a new two-year contract. Wenger’s contract was set to finish at the end of the current season. The man who never breaks a contract will be at Ashburton Grove until 2019. He never was going to leave the club. 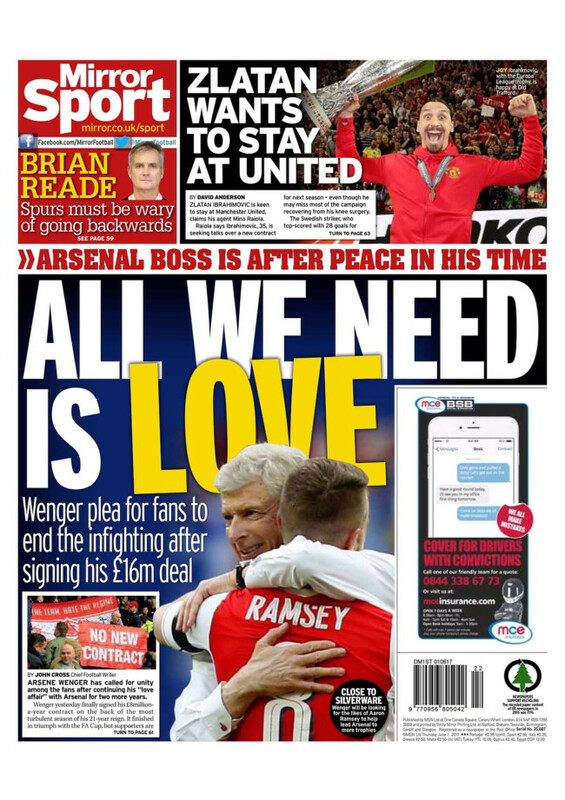 Wenger’s an obsessive. Arsenal is his place and he wants to stay there. Transfer Balls: a look at iffy football transfer reporting. The Daily Mail says Manchester United have targeted “Antoine Griezmann, Andrea Belotti, Romelu Lukaku and Michael Keane in a £300m summer spree”. There are likely to be four. Burnley defender Michael Keane will be one, with the Lancashire club wanting £30million for the United old boy, while Mourinho wants the Atletico Madrid forward Antoine Griezmann to be his stellar signing. Do not be surprised if Marcus Rashford ponders a request to go out on loan, meanwhile. The chances are quite slim of the 19-year-old England striker playing in his favoured position once somebody such as Griezmann arrives. And that’s it. The headline figure of £300m is fabricated. Ladyman mentions two players, whose combined transfer fees would register around £120m. The other £180m is made up of a sub-editor lobbing in the names Andrea Belotti and Romelu Lukaku. QUIDS IN FOR JOSE Manchester United target Antoine Griezmann, Romelu Lukaku, Michael Keane, Andrea Belotti and Eric Dier in staggering £200m-plus transfer spree. According to The Times, up to £200million has been set aside as Mourinho looks to continue rebuilding the struggling squad he inherited from Louis van Gaal. But over there, the Times only mentions three players – “Griezmann, Dier, Keane in £200m spree”. The trick is to get the names one source makes an educated guess at and then add another and round the price tag up to the nearest £100m. Having heard that Manchester City players have given generously to the victims of the Manchester bomb, the Mail delivers a story that casts a shadow over the club. “Jesus returns to his native Brazil following Manchester terrorist attack,” states the paper. “Everybody is helping me here, [Brazilian teammates] Fernandinho, Fernando, but the club as well. They help my family, my friends that are here with me. There’s no mention of the atrocity at all in his interview. Which is odd because the Mail’s headline suggested a clear link between Jesus’ movements and the massacre on his doorstep. Why didn’t he mention the carnage? Because he had already made his plans to fly to Brazil earlier and had spoked to ESPN on May 21st – one day before the explosion! Manchester City pair Pablo Zabaleta and Yaya Toure have donated a lot of money to the relief effort following the attack in Manchester Arena. Zabaleta showed just why he is so respected as a man across the city […] by donating £90,000 from his final match fee. The news an eight-year-old girl went to see her favourite singer and didn’t return home is too much to bear. Yaya and I want to help. We talked this morning about what happened and he asked me what he thought we could do. We have agreed to donate £50,000 each to help the victims of this terrible crime. It doesn’t matter whether the victims are from Manchester or not. Those of us lucky enough to work every day in football can do so because of the generosity of fans across the world. Yaya is from Cote D’Ivoire, I am Russian. It doesn’t matter. Today is a chance for those of us in football to help out. Former Manchester Untied player Phil Neville had a van-load of food delivered to a local children’s hospital after hearing their supplies were running low. Gunner-turned pundit Martin Keown has a view on Mesut Ozil and Alexis Sanchez. They damaged Arsenal with their behaviour, says Martin. What did they do? And did they do it worse than Francis Coquelin, Aaron Ramsey, Theo Walcott, Alex Iwobi or Kieran Gibbs? The nutcase turned up on a day off and trained. The selfish, useless c…! Maybe if all the other Arsenal played trained on their days off, the Gunners might have done better? Why can’t Ozil be more like Keown? Answer in the form of a long ball into the cheap seats. Was it something to do with the death of Indian economist Sulabha Brahme, 84, who passed away on December 1? Did that bring Mesut Ozil to a standstill? What about the murder of Andrei Karlov, the Russian ambassador to Turkey, who was shot dead on December 19? Did that put lead in Francis Coquelin’s boots? Or did it all go wrong when Toyah returned to Coronation Street? Or was it something to do with losing matches? In December Arsenal lost 2-1 to Everton and 2-1 to Manchester City in back-to-back away defeats. The Everton game was very close, with Arsenal having shots twice saved off the line in the game’s dying moments; and in the Manchester City match they were hard done by when the referee allowed two goals that could both have been ruled out for offside – City’s second was egregious. But in each match Arsenal only scored one goal. Not enough. Maybe something else happened – something extraordinary and uniquely damaging? 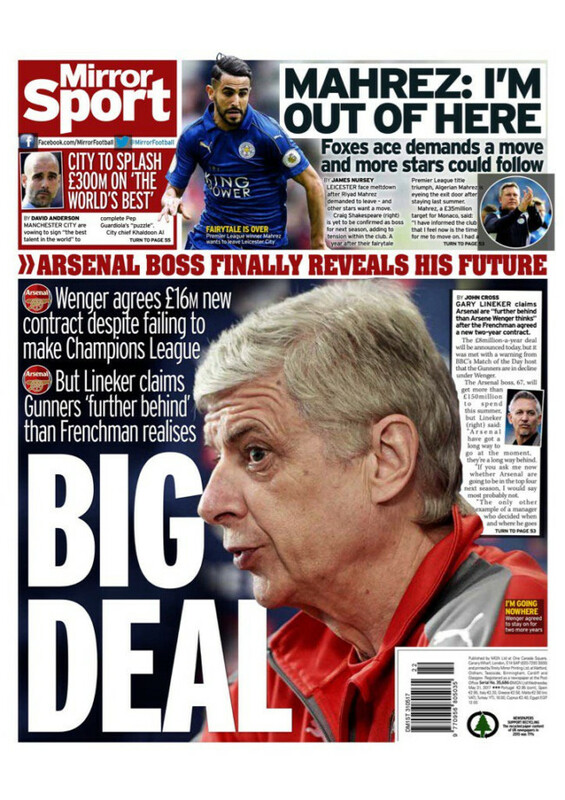 Wenger’s pretty good at saying one day he will reveal all. On buying Danny Welbeck in 2014, he said: “I will tell you that story one day.” Why so mysterious? Is it hubris, gnostic or self-serving balls? “I believe since January we have played in a very difficult environment for different reasons. Tell us now. Go on. We expected Arsenal to be league also-rans and enjoy a good FA Cup run playing bouts of incisive football punctuated by moments of abject, laughable ineptitude. It wasn’t a season of disappointment for Gunners’ fans. It was season of complete predictability. 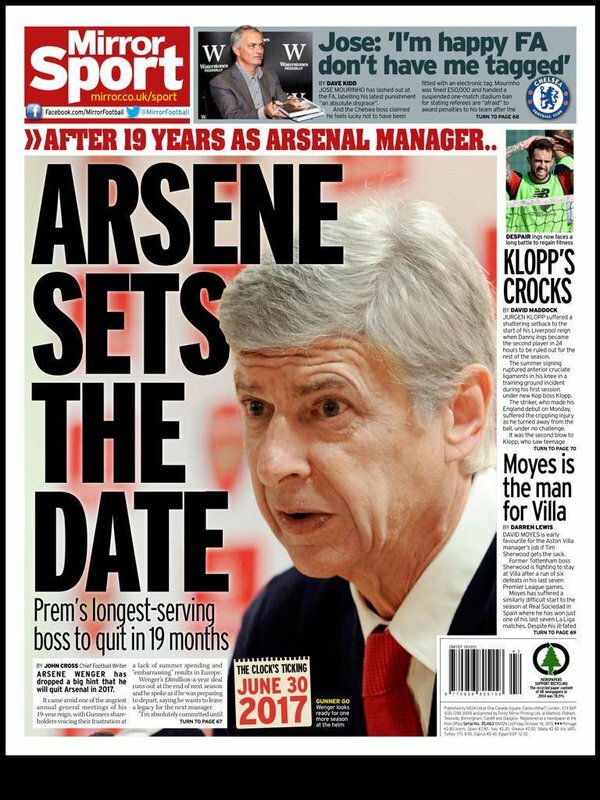 Wenger will tell us all abut it one day – and that nine seasons of the same that preceded it. On the BBC website, you can read Gunners’ “legend”, BBC pundit and financial wizard Ian Wright’s views that Arsenal “need a billionaire like Alisher Usmanov to move forward”. What business doesn’t need a billionaire investor to progress? Such people are undoubtedly handy. Don’t fans accept that their team’s fortunes fluctuate? This is good news for Chelsea, but I don’t know about the rest of Europe. Dutch clubs are used to letting their players move on to ‘bigger’ clubs when they are ready, but if more teams like Chelsea are going to have the same financial clout as, for example, Real Madrid and Manchester United, then players will go abroad at an earlier age. That’s obviously not good for Dutch football or its fans as the standard of our own league will drop. And while money is often good news, it can also create a lot of problems. You have to be very careful when you have so much. Chelsea could go for someone like the Ajax player Rafael van der Vaart, who is young and exciting, but then the fans are going to demand success when so much has been spent. My guess is that they will go for experienced players who will win things quickly. 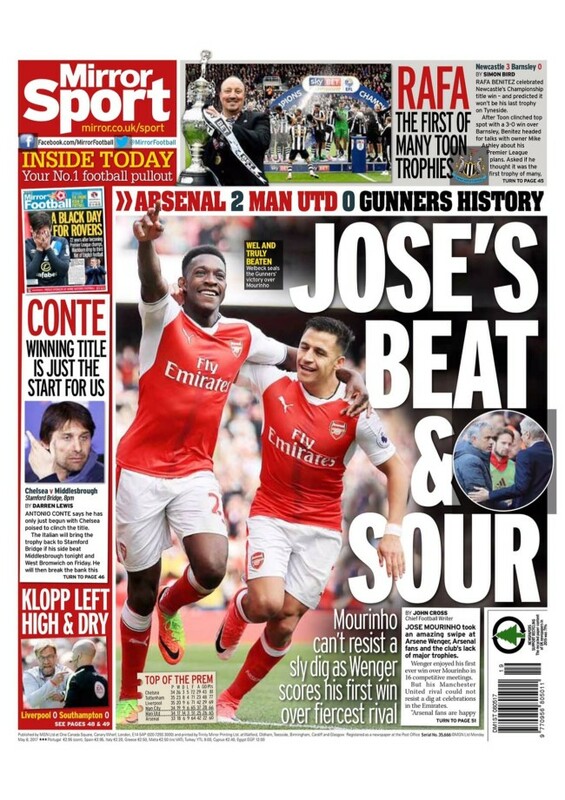 And Arsenal today – are they like Chelsea before Abramovich arrived? Arsenal’s cash reserves are pretty high and of course Arsene Wenger has got this reputation of being quite frugal when it comes to player investment. What people forget is of all the costs associated with running a football club like Arsenal. They have to budget for around £30 million worth of debt servicing. That comes out of those cash balances. So when people talk about a £100 million war chest, you’re immediately saying well that’s £100 million minus £30 [million]. But that doesn’t get reported enough, basically. [In Arsenal’s Annual Report from 2015-16, Keswick noted cash reserves of £226.5 million, reduced to £149 million. Arsenal’s debt service reserve balance, the cash it stores to ensure it will not default on interest payments of around £15 million per season for Emirates Stadium until 2031, stood at £35.4 million]. Arsenal have still got £232.6 million worth of debt on their balance sheet [according to 2015-16 accounts]. The numbers are huge in football’s arms race. Into the Anorak inbox is dropped news that Arsenal shareholder Alisher Usmanov has made a $1.3bn bid to buy out his rival shareholder, ‘Silent Stan Kroenke, and take control of the club. In 2013, the Sunday Times Rich List crowned Usmanov Britain’s wealthiest person. The very rich like buying up swatches of London real estate. So why not buy a stadiumand football club ? If the football fails you can always put a roof on the place and use it as a vault. Mr Usmanov, a metals magnate who owns 30 per cent of Arsenal, conveyed the offer in a letter to Stan Kroenke, the US sports mogul, who controls a 67 per cent stake. The approach, made last month, valued the club at $2bn. Mr Kroenke has yet to formally respond. He is understood not to have dismissed the idea out of hand at first. However, he has since informally indicated he is not interested in selling to Mr Usmanov or anyone else. “Two weeks ago, I thought something could realistically happen. Now I am not so sure,” a person close to the situation said. Arsenal fans can only marvel at how the club they’ve supported has been transformed into a brand for billionaires to play with. David Mellor. The disgraced former government minister was cautiously optimistic about the new Russian-backed regime. “What I think that we have to hope, as Chelsea fans, is the kind of investment that is being talked of will give Chelsea a good run-out in the Champions League,” Mellor, once the chairman of the Football Task Force, said. 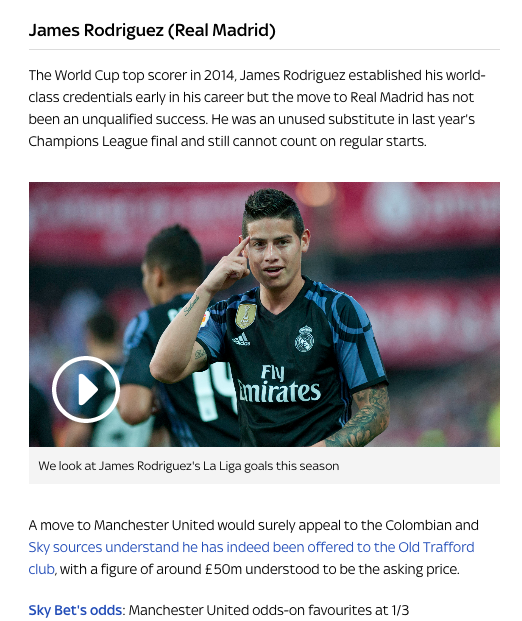 Transfer balls: James Rodriguez to Manchester United is a dead cert – place your bets! Transfer Balls: Is James Rodriguez on his way to Manchester United? Is the player not good enough to start for Real Madrid for more than two matches in a row good enough for Manchester United? 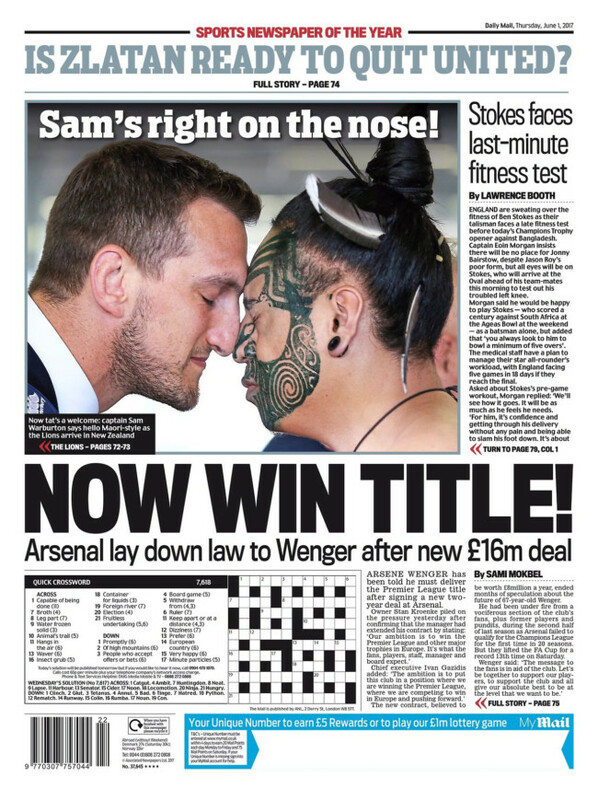 On May 16, the Daily Mail said a deal has been agreed. “James Rodriguez ‘agrees’ Manchester United transfer,” said the paper. Football 365 picked up the scent of the betting companies feeding off the rumours. 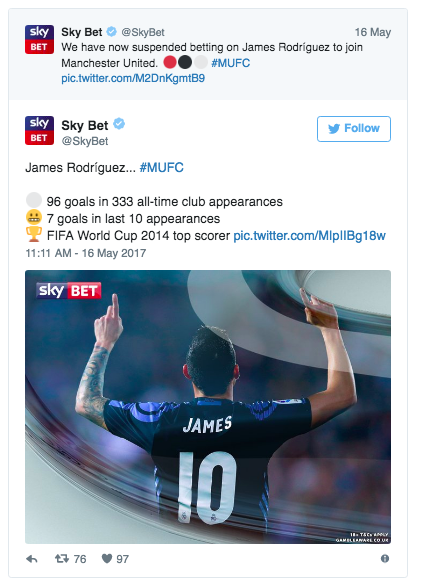 There is no issue with those headlines, and Sky Sports were hardly alone in running them, but when partner Sky Bet then offers odds on James Rodriguez joining Manchester United, it’s not hard to see how those headlines might persuade the public to part with their money. Is it news of is it PR for the betting industry? Fast forward further and most reports on Wednesday morning now say that Rodriguez is not close to a move to Manchester United, that no offer is being made by United and that claims he has agreed personal terms are false. And lo and behold, Sky Bet have opened up their market again to take bets on where Rodriguez ends up next. 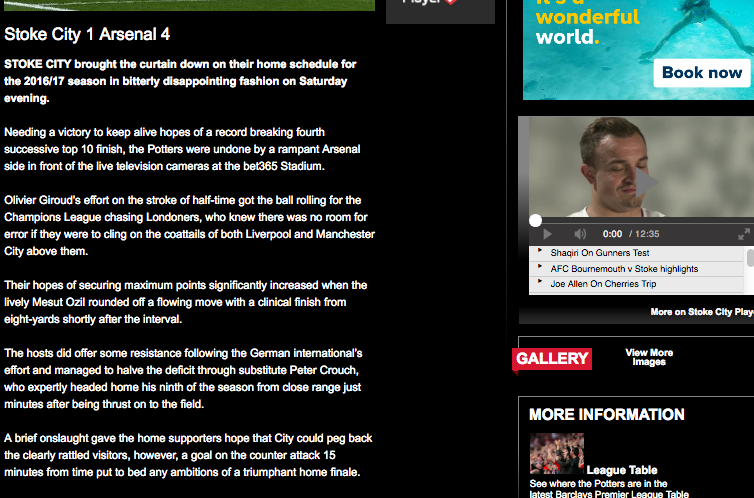 Indeed, in a story updated after 6pm on May 18, Sky reports that there are odds on Rodriguez joining Manchester United. Betting is no longer suspended on what has been presented as a dead cert. Quick – get your money on it while you can! More now from the Daily Mirror’s John Cross, the man who told wrote beneath the headline”ARSENE SETS THE DATE” that the Arsenal manager was leaving the club on June 30 2017. 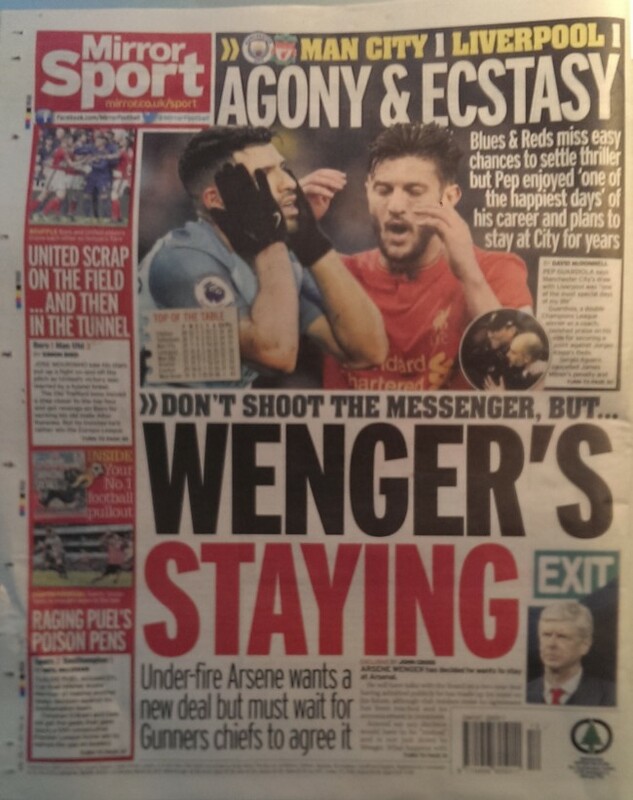 The same John Cross later updated that scoop by writing beneath another Daily Mirror headline “WENGER’S STAYING”. 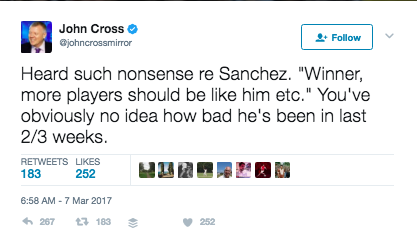 This week, Cross has once more been talking about Arsenal. The Gunners won 2-0 against Sunderland. Incredibly, Wenger’s under-performing side have a slim chance of qualifying for the Champions League – although given their palsied performances in the competition, fans wold be forgiven for finding that an underwhelming prospect. Sanchez is possessed of a “street fighter’s desire that really make him special”, says Cross. Arsenal should “break the bank” for someone so obviously overrated (unless he’s being “red-hot”). Media Bias: when Stoke City’s Peter Crouch scored with his hand against Arsenal in yesterday’s Premier League match, pundits on BBC TV’s Match of the Day pundit meekly said ‘It should have been disallowed’. There was no shame heaped on former England player ‘Crouchy’ for his cheating. It was not his fault that he scored with his hand and then celebrated wildly. It was the referee’s error. How does the media report the goal? A second half “strike” that disappointingly counted. Olivier Giroud and Mesut Ozil struck either side of the interval before Crouch was summoned from the bench and pulled one back for the Potters midway through the second period. No. It came off your hand entirely, Peter. It was handball. But good you were pleased. The hosts did offer some resistance… and managed to halve the deficit through substitute Peter Crouch, who expertly headed home his ninth of the season from close range just minutes after being thrust on to the field. But finally the hosts did break through – albeit in hugely controversial circumstances – as Arnautovic broke down the left once more and whipped in a cross that Crouch sent in via his hand. Injury Balls: a look at unreliable reporting. When Alex Oxlade-Chameberlain was substituted in Arsenal’s win over Southampton, the knives were out. It was all over for ‘The Ox’. We know what fans want because we are them ourselves. But we also know that fans want facts – no matter how much we’d all want to believe that Ronaldo is about to sign for our club. That’s what sets us apart from those organisations who just want your click. We want your trust. It’s not fake news. It’s just to-deadline guesswork. 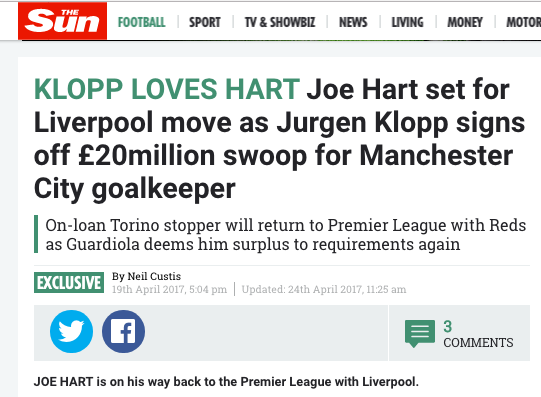 How football reporting works. Manchester City manger Pep Guardiola is speaking to journalists. He says Manchester City are the Premier League’s best at creating changes. That looks like a reasoned appraisal of his side. Man City get into good positions but don’t stick the ball in the net. And, as Pep concedes, that is the hardest thing to do. No. That’s not what he said. Highlight of my day, that. And that’s Jose Mourinho, isn’t it. He’s the brattish kid on tennis camp, a little shorter than most but he’s carrying the oversized racket and always has a can of new balls. In Jose’s monocular vision, Arsenal did not beat Manchester United. Manchester United let Arsenal win, gamely allowing the Gunners to score all the game’s goals and end United’s 25-match unbeaten run. And – boy – what roller coaster of thrills that’s been right. Helluva job Mourinho’s done with history’s most expensive squad: won twice vs top six, fewer goals than Bournemouth, will finish 5th or 6th. Manchester United are at risk of triggering a financial penalty in their £750m kit deal with Adidas should they fail to qualify for this season’s Champions League. United will suffer a 30 per cent cut to their annual £75m payment from the German sportswear giant if they finish outside of the top four. This means the club will lose more than £20m in sponsorship income. 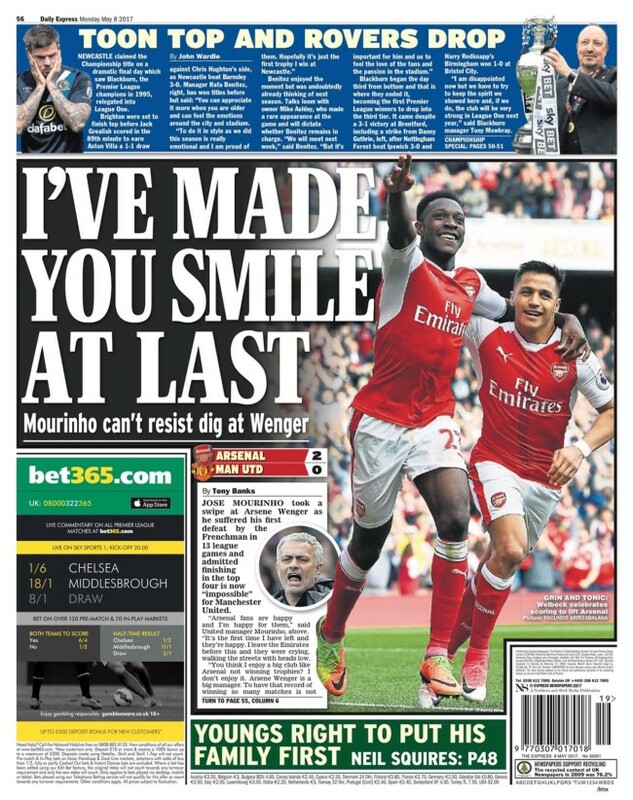 So the back pages, then, which all lead with Mourinho. As of Q1, 2016, Manchester United PLC employed 837 full-time employees. Making a list of who’s in and who’s out might be more problematic than its worth. Zlatan might be better off going with option b: a gold statue of himself stood in the centre circle. PS: the restaurant picks itself. Congratulation to the talented actor and Manchester United striker Marcus Rashford for redefining the phrase “honest English footballer” and in the words of Swansea City manager Paul Clement going “down way before there was contact” and “deceiving” the referee. Rashford’s performance earned United a penalty, and with it another goal for Wayne Rooney. Thankfully, Rashford’s slippery shoes did not cost Swansea City too dear, as the Swans scored late on to tie the match. So how did the clubs’ respective websites see the incident? What about the local Press? Well that is a disgraceful decision and you only fear how costly that will prove. A horrible dive from Rashford who made the decision to go down before Fabianski pulled out. Referee Swarbrick seemed to take an age to point to the spot and the linesman in Swansea’s half was the opposite side of the pitch, blinded by bodies.You can’t say this is what Clement would have wanted because somehow Swansea find themselves behind to a hugely controversial decision when they probably should be ahead. Rashford frustrated by lack of passes to run onto but first time he really does and Swansea defence panicked. It’s not cheating. It’s being sensible. Unless you’re a dirty foreigner, in which case, it’s disgusting. Transfer Balls is watching fake news: Working on the principle that no denial means it could be true, the Daily Star lead its sports season with news that Arsenal’s Jack Wilshere is on his way to China. Maybe. Wilshere was playing on loan at Bournemouth until another injury – a leg fracture – ended his season. 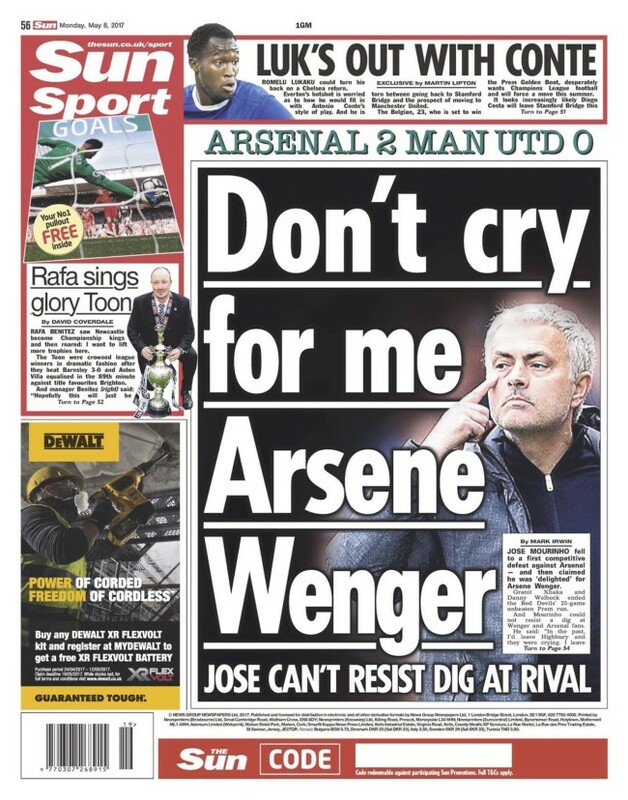 The paper days that “if” talks with Arsenal do not go well for the former PFA Young Player of the Year (2010–11), he could be off to play in China. Where in China, the paper does not say. It’s just China, a place where a young English blade looking for adventures can experience the thrill of the exotic and immerse himself in an ancient culture. Or just cash in as some local tycoon spunks loadsa cash on surplus English flesh. Jack is not looking to expand his horizons in the Far East, says the Star. Jack is “desperate”. China is the British Press’s ‘f9’ – just hit the button and whichever player who like can be off to China. 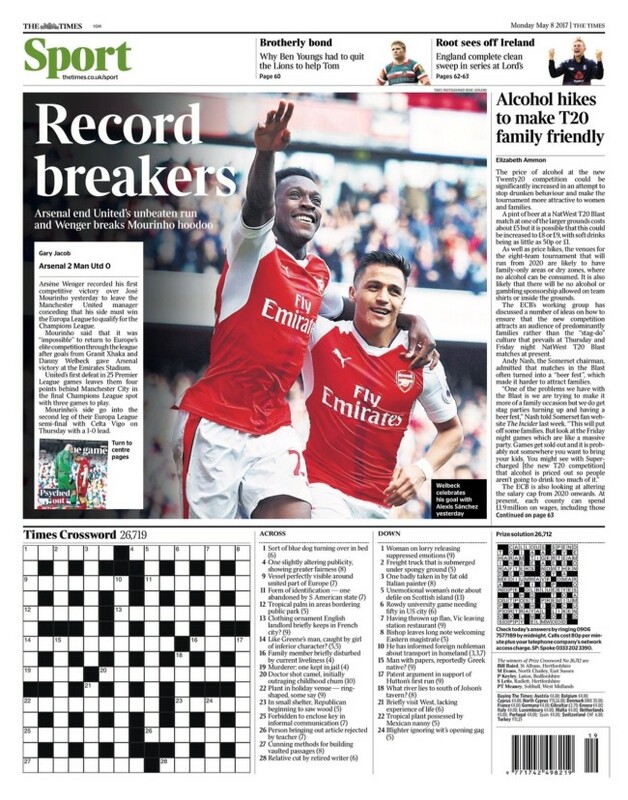 The Star’s story contains no word from Arsenal nor Wilshere but that doesn’t stop the other tabloids wading in. It knows this because – get this – the Express read the story in the Daily Star. No facts needed for the trusty news media to pass on the scoop untested. It’s a human caterpillar of football reporting. Media Balls: a look at biased football reporting. Today Arsenal beat Manchester City 2-1 to make it into the FA Cup final, where they will play Chelsea. Should Manchester City have been awarded a penalty? The game had been free of any controversy, but soon the officials were in the spotlight as Koscielny poked the ball in beyond Bravo – but was flagged offside. It may have disappointed the Arsenal fans, but replays showed it was the correct call – as was referee Craig Pawson’s decision to wave play on when Raheem Sterling went down in the box after a tangle of legs with Oxlade-Chamberlain. Aguero tripped by Oxlade-Chamberlain inside the area. Clear penalty – nothing given. What about Manchester City’s disallowed goal? The officials got it wrong but it was very tight, in fairness. Transfer Balls – fake news for football: The BBC says Chelsea “have reached an agreement” to sign striker Alvaro Morata, 24, from Real Madrid. 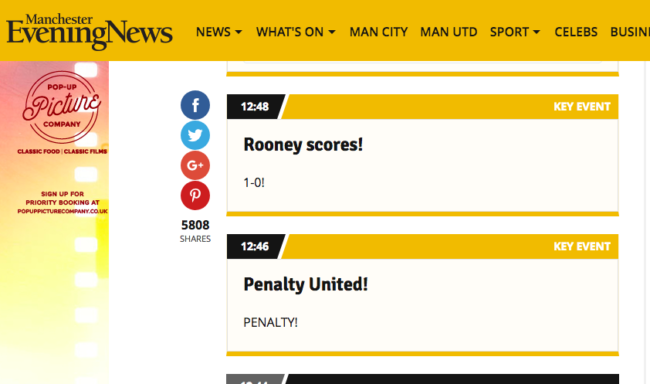 The Beeb’s source is Spanish site Diario Gol. As ever, I like to use Google Translate to tell the source’s story. The worst. Karim Benzema was signing one of the weakest seasons since joining Real Madrid in 2009 . The goalkeeper has scored the same goals as Álvaro Morata in almost double the number of minutes played. The canterano has played 1,593 minutes , while the French accumulates 2,597 ‘ . Benzema is no goalkeeper. But the gist is that Morata is the better striker of the two. It’s not exactly done and dusted. 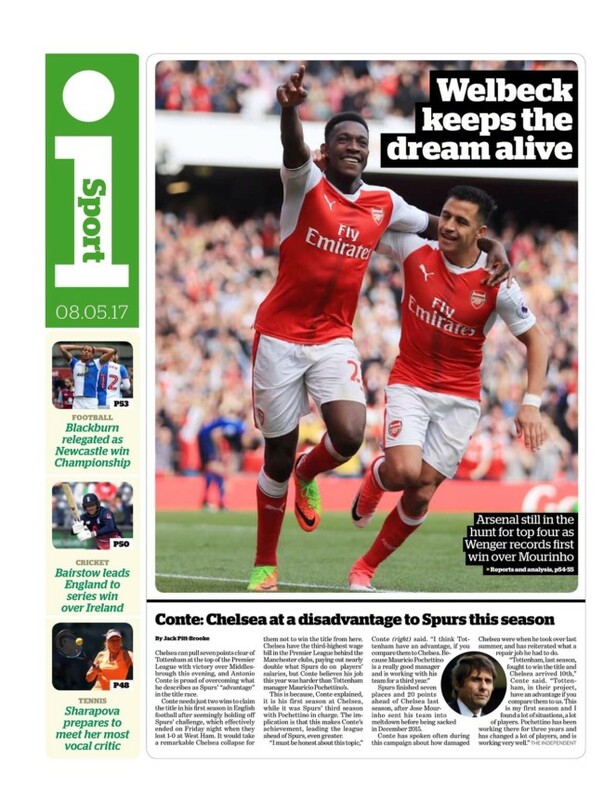 The Week says Morata is only “among potential targets” for Chelsea. The Daily Star says Morata might be heading to Manchester United. And Corriere dello Sport says AC Milan will outbid Chelsea for Morata’s signature.